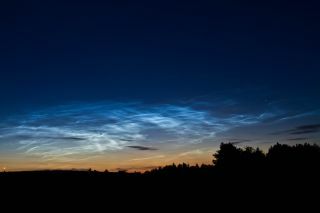 Night-shining clouds, an ethereal type of cloudknown to ripple across the edge of space, were expected to be rare this year, but a new study finds these specters are actually quite common and thicker than predicted. "This is the opposite of what was supposed to happen," said David Siskind, lead study author and a research physicist at the U.S. Naval Research Laboratory in Washington, D.C. The explanation for the extra clouds? Water vapor pumped into the high atmosphere from rocket and space launches, and changing temperatures from greenhouse gases. "We thought there might have been a solar effect, but what we're seeing insteadis a combination of weather from below and water from above due to shuttles and rockets," Siskind told SPACE.com. The sun's cycles change how these clouds shine, with lulls in solar activity linked to more frequent and brighter night-shining clouds. Some scientists think ultraviolet radiation, which gets a boost when the sun's solar cycle peaks, may dry out the clouds. To test this model, researchers have watched the clouds with NASA's AIM (Aeronomy of Ice in the Mesosphere) satellite since 2007, during one the quietest solar cycles in the past 100 years. As the sun's activity ramped up in 2011, Siskind and his colleagues expected to see fewer polar mesospheric clouds. Instead, there were more clouds, and they carried 40 percent more water vapor than expected in 2011 and 2012. The results were published online May 8 in the journal Geophysical Research Letters. In earlier studies, the team had linked shuttle launches to night-shining clouds, even tracking a water vapor plume from Florida to the polar latitudes. But the last space-shuttle liftoff was in 2011, and the Russian Soyuz rockets that carry International Space Station crews now release much less water vapor. However, Siskind noted that the Soyuz's launch site in Kazakhstan is closer to the polar latitudes where night-shining clouds form. "What happens after the end of the shuttle program is an open question," Siskind said. "We really want to know if this effect is going to persist despite the termination of the shuttle program." Changes in the upper atmosphere's climate and temperature, linked to increasing carbon dioxide, also could have affected the clouds, Siskind said, because the clouds form only when temperatures drop below minus 200 degrees Fahrenheit (minus 130 degrees Celsius). "We're using the water content [of the clouds] almost as a diagnostic to tell us about the weather at the edge of space," Siskind said. Email Becky Oskin or follow her @beckyoskin. Follow us @Spacedotcom, Facebook and Google+. Original article on SPACE.com.